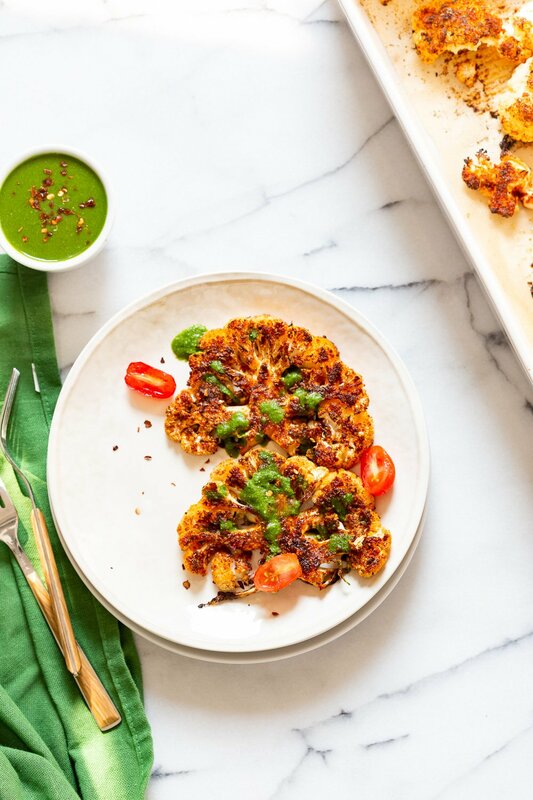 I’ve wanted to make just the Cajun cauliflower since I posted the now very popular Garlic pasta with roasted cajun cauliflower. Creamy Pasta with smoky spicy cauliflower makes a fabulous weekday meal! I make my own cajun blend so I can control the flavor and heat and it works out wonderfully over cauliflower. 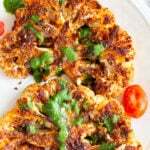 For crispier cauliflower, add some breadcrumbs to the spice mix and then toss. Adjust the heat of the cajun seasoning by reducing cayenne, pepper flakes, black pepper and using more of sweet paprika. 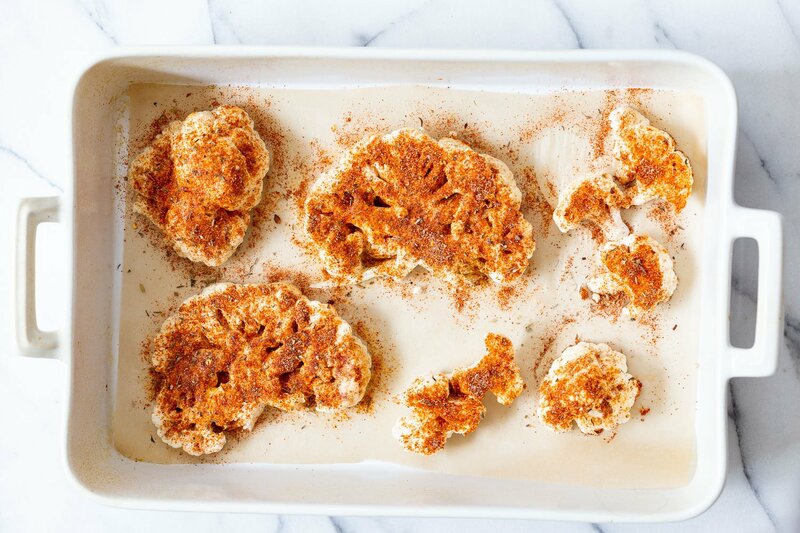 Serve these Cajun Caulilfower “steaks” with some cooked grains or beans in a bowl with some hearty crunchy greens or lettuce to make a meal. Lets bake! Prep your cajun spice blend if you haven’t already, Blend the chimichurri. Rub oil and lemon juice on the cauliflower. Then sprinkle liberally with the spice blend and salt. Lightly spray with oil. Bake until done. Serve hot with chimichurri or other dressing. When cleaning the cauliflower leave,s leave some of the stalk on the cauliflower. The stalk will help hold the florets together. Slice from the stalk side. Slice so that the stalk side is thinner and increase the thickness as you move towards the florets. So the slice will not be even thickness. it will be thicker on the florets side and thinner near the stalk. Small to medium cauliflower make for better candidates for slices. Rub oil and lemon juice all over the slices or florets. Sprinkle the spice + salt on both sides of the slices and rub lightly. Then sprinkle more on the open side. (If using florets, sprinkle spice + salt, then toss well to coat). For Crispyness, mix 2 tbsp breadcrumbs in the spice mix and salt and then sprinkle all over. 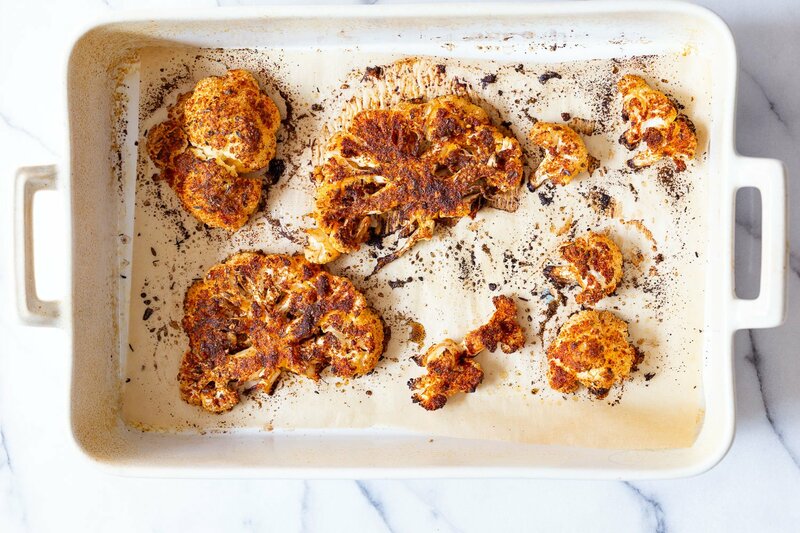 Spray oil lightly on the spiced cauliflower to seal the spices in, Bake at 425 deg F for 20 to 25 mins. Broil for a minute to sear if needed. Cauliflower tends to soften depending on the moisture content after cooking. So serve immediately. Sprinkle some more spice if needed. Cajun can be hot, so add another cooling dressing of choice if needed. Serve with a side salad of beans, chickpeas, or cooked grain or add to tacos, wraps. I make a salad bowl with cherry tomatoes/tomatoes, onion, chickpeas/beans, salt, pepper and chimichurri/lemon with these. Cajun blend can get hot when used in larger amounts. 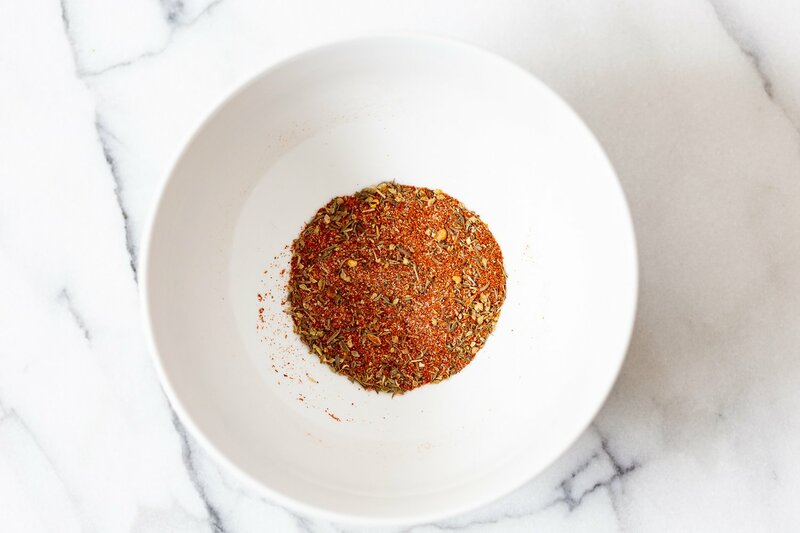 Adjust the heat of the cajun seasoning by reducing cayenne, pepper flakes, black pepper and using more of sweet paprika. For smokier flavor, use half smoke paprika, or add a drop of liquid smoke to the lemon juice and use. I used florets and made these into tacos for dinner. All gone! Turned out amazingly with some breadcrumbs. Fabulous!!! 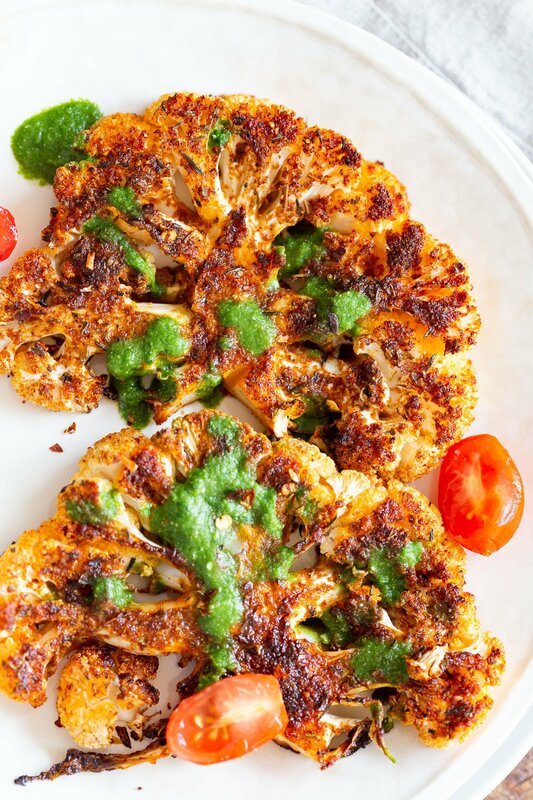 I love the flavors of the chimichurri and the cauliflower steaks turned out great. I think that the addition of avocado is a MUST. I added half an avocado and it really made the sauce rich and creamy. The chimichurri makes a nice addition to freshly cooked pasta as well. A definite hit for me! ABSOLUTELY DELICIOUS!!!!!! I am sitting here at work telling my coworker about how truly scrumptious this recipe is. Thank you!!! yay!! 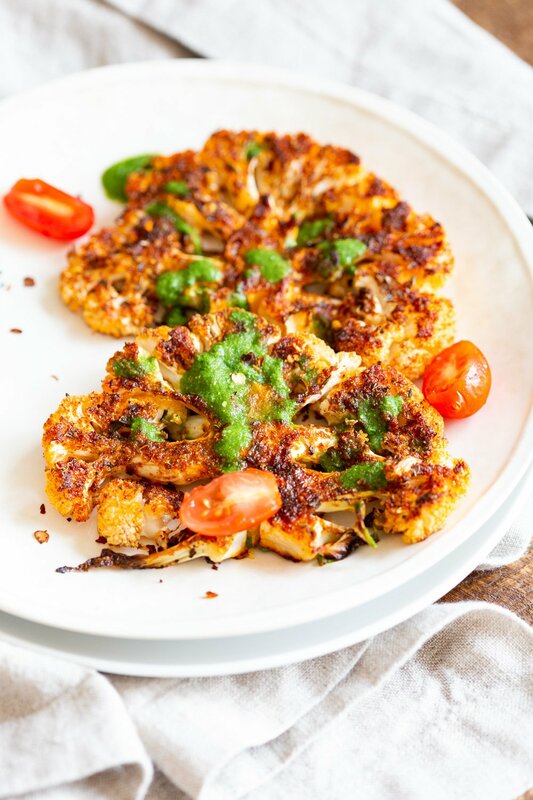 the cauliflower and the sauce are individually so delicious and then together so amazing! Sounds beautiful this recipe, surely I will try it.